Ultraslot, part of Gatic’s Slotdrain range, installed at Barcelona Port. AWMS is participating within the British Pavilion in Hall 3 at The Big 5, which will be held at the Dubai World Trade Centre from November 26 to 29. Each brand is a big name in its own right, well known for innovation, quality and outstanding support. They are: Skyline fascias, soffits and copings; Alumasc Rainwater gutters and downpipes; Harmer Building Drainage; Gatic Civil Drainage; and Gatic Engineered Access Covers. Under the AWMS banner, specifiers and engineers benefit from an unrivalled depth and breadth of water management solutions to suit their individual project needs, confirms Durdant-Hollamby. Gatic has been engineering innovative surface water management and precision-engineered access covers for more than 80 years. The company is a world leader for access covers and high-performance channel drainage and is recognised for its market-leading solutions across the globe. 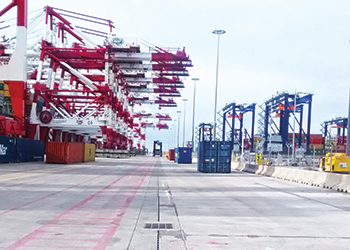 A long-established global brand in the construction, transport and utility markets, Gatic has been specified for major projects around the world in ports, airports and military bases. Some of the prestigious Middle Eastern projects where its products have been installed include Doha International Airport, Madinah Airport in Saudi Arabia and Erhama Bin Jaber Al Jalahma Shipyard, Qatar. “Gatic’s precision-engineered access covers, channel and linear drainage surface water management systems are proven to perform perfectly over decades, designed for performance, strength and looks for a wide range of applications,” says Peter Burnap, Gatic’s managing director. “Gatic’s tried-and-tested access covers are designed to protect cabling and underground services in robust environments and then work perfectly when access is required. Our covers endure constant heavy-duty loading, high traffic volume and changing climate conditions, where failure or under-performance is not an option,” Burnap emphasises. 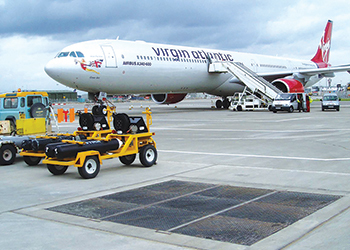 Gatic’s access covers have been specified for major projects around the world. The closely machined horizontal and vertical seating faces of the cover and frame components provide sealed protection against dirt and water, while fitting comfortably and staying stable. The precise fit of the covers discourages the development of movement over time under subsequent wear. Gatic also manufactures access covers for pedestrian walkways, car-parks and public areas such as restaurants and hotels. “This calls for innovative design so the cover is practically unnoticed – matching floor patterns, for example. For maximum safety and security, our covers are available in anti-slip surface material and resistant to tampering,” adds Burnap. Alongside Gatic’s range of access covers, the company is a leader in channel drainage systems with Slotdrain and Filcoten. Often installed on the same sites as access covers, the drainage also has to be incredibly strong, efficient and unobtrusive. Slotdrain’s hexagonal channel profile was originally developed in conjunction with airport sector professionals. The design allows for a self-cleansing flow, and helps prevent blockages. It copes comfortably with the most adverse weather conditions, such as flash-floods which can cause operations to come to a standstill. The 100-per-cent recyclable product range has been developed to suit many different environments from parking areas and housing developments through to heavy-duty docks and airports supporting applications up to F900. Filcoten is an innovative grated channel drainage system manufactured from a breakthrough high-performance concrete (HPC) that is setting new standards in installed strength and stability. “In comparison with other commonly used material options for grated systems, Filcoten’s bond to an identical concrete surround is five times stronger, significantly improving the installed channel’s resilience to traffic loading, ground movement and thermal cycling. “Filcoten is also 70 per cent lighter than conventional concrete; stronger, more durable and more environment-friendly than resin and fibre-reinforced concretes. It achieves a compressive strength 50 per cent higher than conventional HPC without having to revert to the use of chemical stabilisers, additives or releasing agents. Filcoten is 100 per cent recyclable and the only drainage channel to be made with renewable energy,” Burnap asserts. 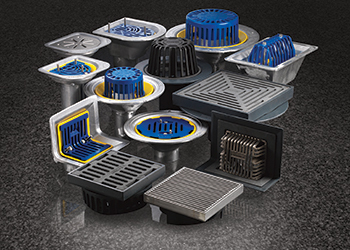 Innovative floor drains from Harmer. Harmer Building Drainage offers specialist engineered products that are robust, lightweight and at the leading edge of technology. They are designed first to perform and then to last, even in the most particular commercial and industrial environments, emphasises Burnap. Harmer’s extensive metal drainage includes cast iron, aluminium and stainless steel. Its products range from floor, channel and shower drains suitable for industrial, leisure, food production, pharmaceutical and domestic applications; through to roof outlets for all types of roof applications; and Modulock deck supports for terraces, walkways, balconies and ballasted flat roof constructions. “Whether its internal or external drainage, our systems work seamlessly together to provide a total solution from roof to below-ground,” Burnap concludes. Extensive technical advice and back-up includes Harmer’s exclusive drainage design calculator, building information modelling (BIM) and design engineer assistance. Its unique bespoke manufacturing combined with the expertise and advice of its design engineers means the company can deliver drainage solutions to suit specific project requirements.